Q. Does the permit allow Nestlé to expand their operations on the National Forest? A. No, the new permit will not authorize the expansion of the current water extraction operations. The permit does include new monitoring requirements as described in the Decision Memo on pages 8 and 9. Q. What if drought continues or gets worse, will Nestlé have to limit or curtail the amount of water coming from the National Forest? A. They might. The Decision Memo adopts resource mitigation measures that include minimum streamflow requirements that must be met before water can be extracted. Q. Nestlé pays very little to the federal government for the water, are the fees going to go up? A. The Forest Service fees are not based on the volume of water, but are based on the fair market value for the use of National Forest System land. The new permit fees will be based on the updated fee schedule and the updated estimate of acres occupied by the improvements. The initial fee for the new permit is approximately $2,050, and will be adjusted when the national linear right-of-way fee schedule is updated. Q. Under the new permit, is Nestlé going to be charged by the gallon? A. No, fees are based on the occupied acreage. Q. Why is Nestlé allowed to take water from the National Forest? A. Surface water in California is a public resource that is regulated by the State Water Resources Control Board, which makes a determination as to the basis for Nestlé’s right to use that water. With full recognition of those rights, the San Bernardino National Forest Land Management Plan allows for water extraction from National Forest System lands, but does require that permitted uses protect forest resources and operate in compliance with all applicable laws and regulations. The Forest Service regulates the use of the National Forest System lands. If a water rights holder wants to install and maintain infrastructure to access water on the National Forest, they must obtain a land-use permit from the Forest Service and follow any terms and conditions included in that permit. If the Land Management Plan requirements can be met, and the applicant has a valid state water right, then the access and infrastructure that facilitates water extraction can be authorized by permit. Q. How does the water extraction impact local groundwater storage? A. Water extraction draws down groundwater storage in the area of the horizontal wells and tunnels, resulting in reductions in surface water flow in the nearby streams and natural springs. The Decision Memo adopts minimum streamflow requirements that will mitigate the impact of groundwater extraction on local surface water effects. Q. How will the plants, animals and threatened/endangered species be protected under the new permit? Currently, there are no known occurrences of threatened or endangered plant or animal species found within the project area. The Decision Memo adopts resource mitigation measures to protect riparian vegetation and suitable habitat so that species would be protected should they be found to be present in the future. Q. How will the Forest Service be able to determine what the baseline conditions are to determine whether or not Nestlé is taking too much water? The Forest Service analysis will be based on a combination of available information and reports submitted by Nestlé, supported with independent field surveys and analysis done by Forest Service resource specialists. The Forest Service preliminary analysis concluded that minimum streamflow requirements were appropriate to protect Forest resources and meet the standards in the Land Management Plan. 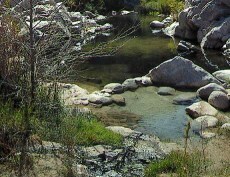 Information collected through the three year permit and adaptive management plan, as well as a final determination from the California State Water Conservation Board regarding Nestlé’s basis in right, will help inform future decisions the Forest Service may make regarding future permits and streamflow requirements. Q. How is the Forest Service going to monitor streamflows? A. Nestlé will be required to monitor flow at established locations. Monitoring techniques will likely vary based on the individual site characteristics, and those details will be included in the Adaptive Management Plan. Q. How often will the Forest Service update the public on the implementation of the Adaptive Management Plan for Strawberry Creek? A. Water extraction data will be available to the public when it is submitted to the state, and streamflow data will likely be available through the US Geological Survey. The overall results will be available towards the end of the permit term when it is used in the next cycle of permit review. If monitoring indicates that actions outside the scope of the Adaptive Management Plan are needed, the Forest Service will solicit public input as part of the review process. Q. Why doesn’t the Forest Service suspend water extraction for five years? A. Nestlé’s use of the National Forest has been in place since 1929 and includes substantial infrastructure. Nestlé’s operations have been consistent with the terms of the last permit which was issued in 1978. In such circumstances, suspending operations to study the effects of issuing a new permit for an existing use, in the judgment of the Forest Service, is not necessary as long as the permittee is operating consistent with applicable statutes, regulations, and the terms and conditions of the existing authorization, as is the case here. This issue was addressed in the Decision Memo on page 23. Q. Will the continued water extraction increase the fire danger in Strawberry Creek? A. The fire resource analysis, summarized in the Decision Memo, concluded that there will be no increase in fire danger. Q. What if the State of California rules against Nestlé’s water rights? A. The State Water Resources Control Board issued a Report of Investigation on December 20, 2017 that concluded that Nestlé has some limited water rights, but that much of the water they divert is without a valid basis of right. Although this staff report recommended several actions, it is not yet a final action from the Board. Both the existing and new permit require Nestlé to be incompliance with applicable laws, including state water laws. The Forest Service will continue to monitor the Board’s actions and require that Nestlé is in compliance with the terms and conditions of its permit. Q. What if the Food and Drug Administration (FDA) determines that Nestlé’s extraction does not meet the definition of “Spring Water”? A. Nestlé’s permit from the Forest Service does not require that the water be used for a specific purpose, so any action related to labeling of the water would be determined by the FDA. In a letter dated August 21, 2017, FDA concluded that the water from the springs under permit could be labeled as “spring water” as long as the current conditions described by Nestlé and all other applicable provisions of the bottled water standard are met. Nestlé is in compliance with the existing permit on that basis. Q. With the current drought, I am forced to conserve water, yet Nestlé has not had to reduce their extraction, will this change under the new permit? A. Nestlé will need to comply with the terms and conditions of the new permit, which include minimum streamflow requirements. The State Water Resource Control Board staff has determined that Nestlé’s surface water extraction is subject to state jurisdiction and Nestlé would have to follow any water restriction orders issued by the state. Q. Why does the Forest Service allow water from the National Forest to be sold for profit? A. There are no provisions in the applicable laws, regulations, or policy that would require special use permittees to operate on a non-profit basis. Q. Plastic bottles create pollution, shouldn’t the Forest Service not allow bottled water? A. Restricting use of bottled water is outside the scope of the Agency’s permit authority. Q. Does the new permit comply with the Land Management Plan? A. Yes, the new permit is consistent with the Land Management Plan. You can see the full details in the Decision Memo on pages 28 and 29. Q. How does the new permit address climate change? A. The new permit will include provisions for instream flows, which will improve riparian conditions over the permit term, and will prioritize that water is available for streamflow and aquatic resources. While this approach protects against changing stream flows that may be associated with climate change, it will be difficult to detect any climate change effects during the term of the new permit, because climate change effects operate over longer time scales. Q. Can I appeal issuance of the permit? A. No, issuance of a new permit is not an appealable decision. Q: The state said Nestlé was illegally taking water. Can you stop their permit? The Forest Service can revoke or suspend a permit for noncompliance with applicable statutes, regulations, or the terms and conditions of the authorization (36 CFR 251.60(a)(2). If Nestlé chose not to comply with a State Water Resources Control Board order and operated in violation of that order, the Forest Service could take action. The State Water Resources Control Board has not issued an order at this stage in their review. Q. Can you cite/prosecute Nestlé for appropriating water without a permit from the state? The Forest Service can cite and prosecute any permittee for violation of the terms of their permit (36 CFR 261.10(l)); however, the normal practice is to use the administrative procedures described in 36 CFR 251.60 to achieve compliance. Criminal prosecution is used when a permittee continues to knowingly operate in violation of a noncompliance notice and the administrative process has not achieved compliance with the terms and conditions of the permit. Q. If Nestlé has rights to Indian Creek, does that mean they’ll move their infrastructure to there and remove it from Strawberry? Nestlé has not proposed such a move and the State Water Resources Control Board has not indicated to date that such a move would be necessary to utilize those water rights. Q. Does Indian Creek have the same flows as Strawberry? If it’s less, does that mean Nestlé has to take less? The State Water Resources Control Board makes a determination as to the basis for Nestle’s claimed water rights. Q. Why is the permit being issued for three years? Three years is the minimum timeframe needed to complete the required studies. The decision provides for discretionary annual permits for an additional two years in case additional time is needed due to unusual wet or dry years during the study period.